“I have been designing lesson plans and training for individuals and classes since I began bookbinding. It is such wonderful and exciting work, I have always wanted to share what I’ve learned.” Students have come with varied interests and requests. One wanted to develop a product line of small books and albums to sell at craft shows. Others have wanted traditional education to predominantly create new books, and then there are those many folks who want to restore and repair old books and papers. Syllabus: This includes many topics depending on the interest of the student. An overview of the history of the book, the evolution of bookbinding structures, materials, products, and current trends. Review of who’s who and a bibliography of source books. Schools and programs currently available to the student of library science or hand bookbinding/restoration/conservation. Three first projects examine three historic non-adhesive structures including Coptic binding, long stitch and Japanese stab binding. Constructing a signature sewn case-binding using raw materials of paper, board, cloth, adhesives and thread. Types of sewing include: tapes, sunken cords, raised cords, and muslin hinging. Students learn to prepare end sections, round and back, line out and hang into the case, paste down end sheets. They learn both French groove or library binding structure as well as English or tight joint structure. Basic book repair includes evaluation of problems, type of structure, paper acidification, dirt, damaged joints, bumped corners, broken thread, and much more. Students disbind a book, learn dry and wet methods of paper cleaning, use of kozo and starch, as well as heat set and filmoplast for paper repairing. Text blocks are cleaned, repaired and resewn and cases are repaired and reattached. Both full and Yale rebacking of books is explored. Products in current use by conservators and restorers are presented. Students learn about the use of leather in binding. A new binding is constructed with laced on boards, hand sewn end bands, raised cords and tight back. Leather paring is practiced with both English and French style blades. Use of reference materials and on-going research become the learned habits of a lifetime, puzzles explored and mysteries revealed about the books in our care. This is a lifetime study. Beginners learn how to reback a leather binding with new leather or Goldbeater skin. They also learn the Etherington technique of rebacking the leather joints with kozo papers. Leather dying and paring are practiced. Products that extend the life of binding materials become familiar helpers in the daily work. Reliance on reference materials becomes a learned habit the “perfect” fit, not too tight and not too loose, just right! Students will learn to set type for use in hot gold stamping, hand titling and decorative tooling. 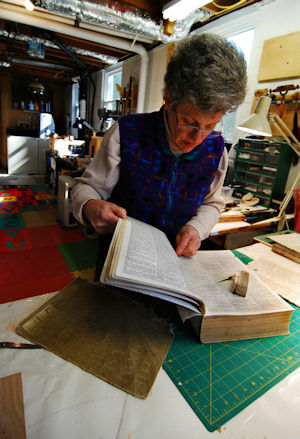 The evolution of different type faces, use in art bindings and restorations are all examined. Use of gold and glare as well as gold foils are practiced. Other finishing techniques are studied including onlays, inlays, and leather sculpting for books. These explorations depend very much on the interests of the student. They could include: marbling of paper and cloth, miniature bindings and small editions, paste papers, making photo album pages using kozo hinging, sculpting of pewter covers (repujado), printmaking as a illustrating technique, and others. Note for Vermont Residents: The Vermont Legislature designates a certain amount of grant money every year for Vermont residents who want to pursue education or training beyond high school. These grants are administered through VSAC. Light of Day Bindery offers training courses and meets the requirements for being an approved school for the Vermont Non-Degree Grant Program. For additional information, visit VSAC.org.